Treat your skin to the L’Occitane’s Shea Butter One-Minute Hand Scrub, a super-speedy formula that works to reveal beautifully soft hands in an instant. The secret to delightfully soft and smooth hands, elbows and heels, the L’Occitane Shea Butter One-Minute Hand Scrub is made with 10% organic shea butter and husks from shea nut which gently buff away dead skin cells to reveal more radiant looking skin. Ultra nourishing, the formula also contains a skin-softening combination of apricot oil and allantoin to beautify and smooth. For 2018, the original jar is transformed into a practical tube so that your favourite treatment can easily accompany you wherever you go. Apply the scrub directly to dry hands, massaging the product in gently whilst focusing on cuticles, then rinse thoroughly with warm water. AQUA/WATER, BUTYROSPERMUM PARKII (SHEA) BUTTER, GLYCERYL STEARATE, GLYCERIN, DICAPRYLYL CARBONATE, CAPRYLIC/CAPRIC TRIGLYCERIDE, SILICA, ARACHIDYL ALCOHOL, MYRISTYL ALCOHOL, CETYL ALCOHOL, CERA ALBA/BEESWAX, JUGLANS REGIA (WALNUT) SHELL POWDER, PRUNUS ARMENIACA (APRICOT) KERNEL OIL, HELIANTHUS ANNUUS (SUNFLOWER) SEED OIL, POTASSIUM CETYL PHOSPHATE, MYRISTYL GLUCOCOSIDE, CAPRYLYL GLYCOL, ARACHIDYL GLUCOSIDE, ALLANTOIN, BEHENYL ALCOHOL, XANTHAN GUM, SODIUM HYDROXIDE, CHLORPHENESIN, TOCOPHEROL, MICA, PARFUM/FRAGRANCE, BENZYL ALCOHOL, BENZYL BENZOATE, LINALOOL, CITRONELLOL, COUMARIN, ALPHA-ISO-METHYL IONONE, HEXYL CINNAMAL, LIMONENE, CI 77891 / TITANIUM DIOXIDE, CI 7791/IRON OXIDES. L'Occitane Shea Butter One-Minute Hand Scrub 75ml is rated 4.0 out of 5 by 3. Rated 2 out of 5 by Firefly from Not for me I thought I would give this a go as I suffer with a lot of dryness around my cuticles, which then splits and looks very unsightly. 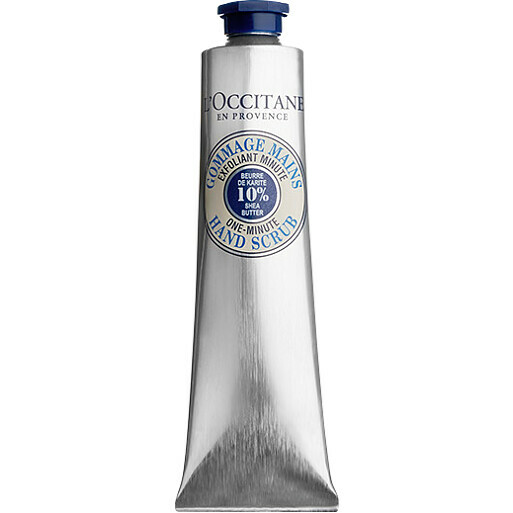 I am a fan of a lot of L'Occitane products, but I have to say this has done nothing for my hands and in fact leaves them very dry, so I won't be purchasing it again.